Why does this heuristic work? Basically, your muscles store fuel, just like a car. Generally, you have enough fuel for about three hours of aerobic, or low-intensity, activity before you need to stop for gas. Muscle fuel is called glycogen. Eating calories fills up your fuel tank. Working out uses that stored glycogen. A lot of runners are familiar with the phenomenon called “Hitting The Wall.” Hitting The Wall happens towards the end of a marathon, when your muscles run out of glycogen. 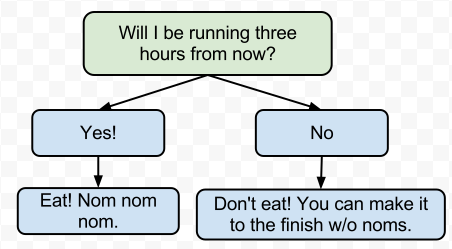 Endurance athletes, like marathon or ultramarathon runners, have to figure out how to eat during their longer runs. Obviously these races will take longer than three hours. My advice: each athlete needs to figure out what works for them by trial and error. I don’t eat solid food unless I’m running a distance longer than a marathon. I also don’t eat unless I’m at an aid station. Aid stations are usually an hour or two apart, which seems to be far enough to prevent over-consumption, and short enough that I can get enough calories. I usually skip eating at the last aid station, because those calories won’t actually help me finish the race; it takes a bit of time to digest and metabolize calories. The benefits of consuming calories during a race, are, unfortunately, not immediate. So, what about workouts that are shorter than three hours? You probably don’t need to eat. Let me reiterate: You probably do not need to eat if your work out is shorter than three hours. In fact, eating during any workout can be detrimental to your performance during that workout. When you eat, your body diverts energy from your workout to your digestive system. Because your body is spending so much energy on your activity, it has a hard time digesting any calories, especially solid ones, during a workout. (Side note: this is why energy gels, like Gu, work so well – they aren’t solid calories). I’ve only hit the wall once, and it wasn’t even during a long race. I was running a half-marathon training run – not a race – with some runners in San Francisco. I hadn’t eaten breakfast that morning, and it was a late start run. I had about 0.5 miles to go in the run, and I crashed; I felt dizzy and light-headed. I could see my car from where I was, but I had to lie down on the grass for several minutes before being able to walk slowly to my car. People who run half-marathons, or even marathons, with CamelBaks. The added weight might cause injury, and you don’t need that much space to carry water with you. Honestly, even carrying CamelBaks during well-supported ultramarathons doesn’t make a lot of sense to me. Hash House Harriers. Trust me – you guys do not burn as many calories as you consume during those events. Caveats: This post has nothing to do with pre-workout or post-workout nutrition. It also has nothing to do with consuming water. It’s only about consuming calories during a workout. Workouts May Not Be the Best Time for a Snack (New York Times). Recent article about fueling during workouts. Basically says the same thing I say here. The comments are great. Wikipedia article on Hitting The Wall. Short and sweet overview on mechanics of glycogen depletion. Tl;dr: See the first graph. Seriously, this works. Just find out what your equivalent of three hours is and go from there. What’s your favorite food to eat during a long race? This entry was tagged fuel, graphs, insights, marathon, nutrition, race, running, ultramarathon. Bookmark the permalink.